Spray Polyurethane Foam is made by mixing and reacting chemicals to create a foam. The mixing and reacting materials react very quickly, it expands on contact to create foam that insulates, air seals and provides a moisture barrier. Usually every home is different. It really depends on if your home is newly constructed or if we are talking about insulating an older home. With a home that is older, more time is necessary to get the job done accurately and efficiently- so the final cost may be more. The price will vary between jobs but with our company we always ensure our customers with the best prices possible. It is very important to us that we take a look at each home individually and figure out what type of insulation would be the best match for the job. Who is it best for here in Baltimore? When dealing with a new construction site, spray foam is great! 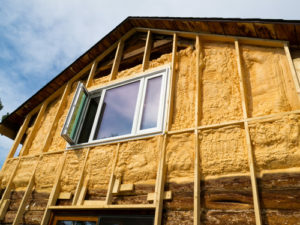 Being a local insulation company here in Baltimore we can make sure to be effective in designing it against heating, sound, and keeping those utility costs low. It is the #1 insulation for preventing air leakage, so why not give it a try and save money right off the bat. Spray foam is very versatile when it comes to who is the right candidate. Not only is it great for using with newer homes, but when we are remodeling and renovating as well! Its perfect to use because sometimes the space left in the walls doesn’t leave you with a lot of room to work with, thankfully spray foam can be used easily to fit and seal the tight spaces Nothing would compare to insulate your home as good as SPF. In the end we ask ourselves, is it really worth the money? The answer is yes. Give us a call today to your neighbors here in the Baltimore area to see if Spray Foam is right for your home! We will be sure to give you the best options for your space and go over in detail the benefits of using it. We are confident that you will be making the best choice to save money now and in the future.